This is the fifth of seven installments of daily stories from the life of Christ. Even if you didn’t read through any of the previous weeks’ material, however, it’s not too late to begin preparing for Lent; while Week 1 started with Jesus as a boy, there’s no reason you can’t jump in and follow our Lord in the rest of his journey to the cross. Below I’ve linked the PDF for the week beginning with this coming Sunday. I haven’t posted since the beginning of November, when I nervously embarked on my misguided, first-ever NaNoWriMo. I was right, using every moment of my free time to write and not getting to bed until midnight or later did take its toll. In fact, it’s only now that I’m starting to feel human again. By December I was 100% burnt out. This month I had intended to edit my novel as suggested by the folks at NaNoWriMo, but I can’t bring myself to touch it yet. My kids, on the other hand, have been begging to get back to their beloved Young Writers Program (the kids’ side of NaNoWriMo) stories, so we’ve started the editing process. Initially, I had thought that we would attack their stories element by element, channeling the story-writing checklists I made years ago as a teacher: read to make sure it made sense, edit for spelling and punctuation, polish the beginning, work on some description, check for vivid verbs… But as soon as we began that first read-through, that approach felt too fragmented. No, editing your work is really more holistic than that. When I read over my writing, I don’t scrutinize just one part of speech at a time, I assess the overall effect of my words–am I clear? Is the tone right? Do I have enough detail to create a complete picture but not so much as to drown my reader? And so I began it with my kids. After our initial read-through on that first day, we’ve been taking the stories a paragraph at a time. First I read the paragraph (or section, if it’s dialogue) aloud to them and ask if there’s anything they’d like to change. Then I go through it line by line and help them improve their work. I show them where pronouns have unclear antecedents, I explain my mental image after a particular sentence and have them clarify or correct as needed, I point to something I find interesting and ask for more detail, I ask if they can pick a more interesting noun or verb or adjective to replace a mundane one, I ask if a certain section has anything at all to do with the plot. The over-the-top colleague who insisted on spending hours each week poring over her third-graders’ writing word-by-word with each of them…she actually had the right idea. Somehow I had it in my head that excellent writing would just begin to grow naturally in children and I should keep my hands off lest I taint their authenticity. After all, I learned to write simply by writing. But I learned to draw well in part because of careful instruction. I learned to clean and to cook and to drive because of supervised, scaffolded experiences. Why shouldn’t writing be the same way? This whole experience affirms for me the need to approach writing instruction from multiple angles. I had tried a theme book from IEW (Institute for Excellence in Writing) and loved what my children learned–vivid verbs, who/which clauses, sentence openers…but by halfway through we were feeling stifled by the routine and the narrow constraints of the assignments. This year I thought we’d do more freewriting, but sometimes we’re just not inspired to write, and often the results of our inspirations were lackluster. Editing with my children has shown me both the joy my children glean from their own creative writing and the worth of a program that helps them learn the tools to write well. So how will this affect writing instruction in our household? First of all, I’ll remember that my active modeling and instruction will help their writing develop just like it helps other skills. And I’ll remember from now on that I do not have to commit wholeheartedly to one ideological camp or another, nor do I have to finish one curricula in sequence. As I’ve learned with all the subjects we’ve worked on so far, the best choice for our family is a sprinkling of different things. So going forward, I just might pull out that other IEW theme book I purchased and choose a lesson or two to do…and then perhaps we’ll do some writing of our own and try applying our new techniques to our own writing. Because writing is both mechanics AND creativity, and having them come together seamlessly takes practice. It’s November. Somehow I thought it would be a good idea to do NaNoWriMo. My oldest has loved writing stories from the time he was first learning to sound out words, and he had been asking to do more writing all through October, so I suggested he try NaNoWriMo. And then I thought, “What better bonding than a common goal?” So I suggested that I try NaNoWriMo, too. I was a bit daunted when I found out that my word count goal was a predetermined 50,000, but I had told my children I would do it, so I signed up. It’s November. I’m doing NaNoWriMo. My life currently consists of caring for my children and, after the last one is finally down at 9, frantically writing, trying to squeeze enough creativity out of my rusty fingers to make it to each day’s word count goal. It takes me much longer than it did in college, when creative writing was something I had time for. And then I still have to prepare for the next day’s school work or activities before falling into bed. I’ve been going to bed at midnight and not getting any downtime. It’s only November 5, and I am surviving so far…but I have a feeling it won’t be long before I’m exhausted and dragging, cranky from a lack of sleep and a lack of free me-time. If you are homeschooling, NaNoWriMo is a great program for your kids. If you do it yourself, then you are likely of questionable sanity. My three-year-old is extraordinarily stubborn. Not surprisingly, one of the things he flips his lid over is tooth brushing. He has never liked this necessary task, and for as long as we’ve been doing it, I’ve dreaded the nightly struggle. Now, abruptly, he is standing nicely and opening wide for brushing–albeit with the occasional gagging noise. What has made the difference? A kiss. One evening I blew him a kiss, pretending two of my fingers were the kiss drifting toward his cheek–and he swatted my hand away. I made the kiss squelch onto the carpet, which he thought was hilarious. He requested another kiss (to swat elsewhere), and I said he could have one if he let me brush his teeth. It’s been a week now, and all I have to say is, “Open your mouth so you can get your kiss!” and he stands nicely with mouth agape and submits to brushing. He almost forgot to wait for the kiss tonight. It isn’t as if this is the first time I’ve tried a creative tactic for brushing teeth, but for some reason, this tactic at this moment was just the right thing. Isn’t it strange, the little things that can break our routine approaches and change our perspectives? My husband’s grandparents’ cottage is about four hours from our home, in a lake-laden region home to only a sparse crop of locals—mostly farmers, it seems—when it is not overrun with vacationers in the summer months. While the main roads in the area are paved, some of my favorite local travels have been on the dirt roads. The cottage itself is on a dirt road, a single lane tunneling through a hilly woods, one which always makes me imagine what it must’ve been like to be one of the early settlers in the region. Other local dirt roads hold equal gems: long-abandoned farmhouses hiding in overgrown fields, tidy cottages situated at the end of tree-lined dirt driveways, squat ranch homes with a half-dozen haphazard additions surrounded by the flotsam of life. I always watch inspect the homes with interest, wondering what sort of person has made their life on this quiet path. I collect and peruse real estate catalogues, dreaming of owning a hidden parcel of land in solitude. Then reality strikes, and I realize that such a dream would, besides making it virtually impossible for my husband to find a job, remove me from the nearness of my parents, eliminate our connection to the few friends we’ve found, and separate us from the opportunities afforded by a populated locale—scads of parks to visit, kids’ classes available through multiple nearby park districts and oodles of local businesses, multitudes of different library branches, a variety of concerts and plays, and community events galore. I would love the solitude, but I would miss the civilization. In some ways, I feel like I’ve already made the move to solitude decades ago, living in civilization but not gaining the full benefit of it. My mom has told me that nearly everyone feels at least a little lonely and set-apart, but since we are each unique, we can never truly feel understood. Somehow I feel more set-apart than I believe most people do (though I guess I’ll never know). Some of it I’ve brought on myself (like being too lazy to hook up my TV), some of it is situational (like not having enough in the budget for much entertainment), and some of it is hereditary (like being utterly unathletic). Oftentimes, the road less traveled is a beautiful one, full of scenery others are missing. Sometimes, however, you begin to tire of being alone on the road. You think that there are many lovely well-traveled roads, and you wonder if you really ought to consider taking fewer scenic routes. This afternoon found me basking in the sunshine in our front yard and bonding with what is perhaps my least favorite yard tool—the hedge shears. On a side note, I ought to add that perhaps its status as my least favorite yard tool is because it is the only yard tool over which I have sole responsibility. The last time I mowed the lawn—five years ago—I ended up with blisters on both palms and my arms vibrating for the next two hours. My husband declared me too wimpy to do yard work and said he’d just do it all himself. Though he did admit that he doesn’t half mind the excuse of something to do out of the house now that we have kids. At any rate, I retained authority over the hedge shears due to his proclaimed incompetence at the task. I don’t doubt his incompetence at hedge trimming (it’s one of those finicky tasks that better suits my personality), but I do harbor a sneaking suspicion that if we ever came into possession of an electric hedge trimmer, his competence level might suddenly increase to acceptable levels in his eyes. 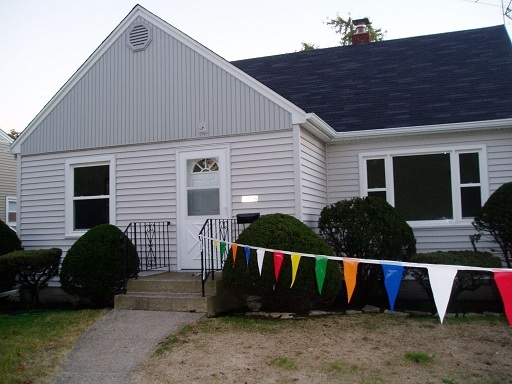 Here’s a shot of the front of our cute little first home, taken when we first saw it. The bushes were neatly trimmed, but distinctly awkward in proportion–and the following spring they tried to overtake the front window. And did I mention that it took us FOUR YEARS to get the front lawn to grow decently again? At any rate, there I labored, giant scissors in hand, struggling to trim our bushes—yet again—to something slightly less than they were last year. You see, we live in a 50-year-old home, built in the Era of Evergreens. In our last home, the front evergreen bushes were allowed to gradually overtake the front of the house. In our current house, the bushes on the side threaten to devour the walkway, while those in the front have melded into one giant lump of amorphous bushiness. My goal is to prevent them from taking over the world before we have a chance to figure out what to do with them—or without them, as the case may be. Whilst I trimmed away, my older two kids dashed to and fro, rumbling two-legged garbage trucks gathering up armloads of trimmings and depositing them in the garbage. The proximity of the two tasks—hedge-trimming and child-watching—led me to drawing comparisons. And then there’s children. Most people have a general notion that everyone should have some, that having children is a good idea. Most people don’t take much note of others’ kids unless they are remarkably unruly or remarkably attractive. And as for your own children, while you might have brief moments of quiet satisfaction regarding them, for the most part you are caught up in their maintenance. And that maintenance is perpetual. Sounding eerily familiar? Never in my life had I thought to compare my children to my front hedge, but there it is folks, irrefutably in print. And I’ll bet you didn’t think I’d make a good case for the similarity. At any rate, all this leads me to thinking yet again that the most difficult part of life is that there is no “off” button, not even a “pause” switch. Because whether it’s bushes or babies, if you take the slightest break, you will pay for it with sweat and tears, if not blood, for some time to come. And that, my friends, is why life is exhausting. Perhaps my children will perform more self-maintenance with age (one can hope? ), but the front yard will never give me a break. 3. A Hair-ible excuse. Bad hair day? Didn’t have the energy to brush it at all? Couldn’t care less how you look because the kids have sapped every last ounce of your energy and laid a claim on all future energy for the next two decades? At least you have an excuse ready in case someone else DOES care. Blame it on the weather. Aren’t you glad I bothered to blog today?